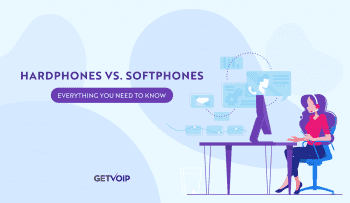 Interactive Voice Response (IVR) systems are nothing new; we all know how they work, and depending on from what point of view we’re looking at them from, we all have our own opinions on their capabilities and effectiveness. What we’re trying to do is give you the best overall look at how “Press One for X” is turning into something much more unique in 2018 and going forward. For example, two major IVR trends in 2018 are natural language processing and Visual IVRs. Already, you might be asking How can we visualize phone calls with businesses? and, inevitably, Do we even need this? The short answer is: yes, you do. If you’d like to stop reading, you may; although, it’s not necessarily advisable. For those of you who are wondering why these latest trends matter, we’re going to break down how far IVR systems have come along and the direction they’re headed in. 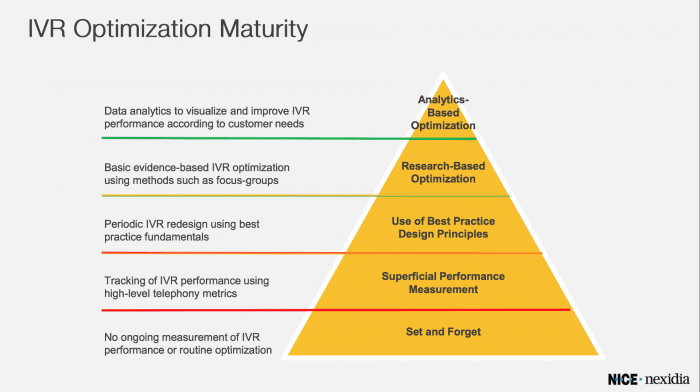 It’s not enough to simply explain what each IVR trend is. We have to talk about their relationship to other significant business trends such as omnichannel experiences, self-service, and the overall effort to improve the customer experience. IVR systems can be defined as a telephony menu system that enables identification, segmentation, and routing of callers to the most appropriate agent within a business’ team. Like we alluded to before, this can come in the form of “Press 1 for X,” or “Press 2 if you’d like to speak to a representative.” IVR is intended to act as a self-service option for customers looking for quick solutions while ensuring support agents are handling tickets that are actually worth their time. Unfortunately for traditional IVR systems, companies have found that most people do not enjoy navigating through the robotic menus. Most customers already feel like they need a person-to-person interaction with an agent who would do a much better job at handling their problem than an automated system that might not actually get it right the first time. If they don’t get it right, then it leaves the customer wondering what the point of the system is if they end up speaking to an agent anyway. It can just be a frustrating experience that most callers would like to avoid. Traditional IVR systems definitely have their place, like in small businesses where the number of steps it takes to reach a representative are fewer, and the information customers need is front and center. But for larger, more complex companies who need more personalized interactions with their customers, traditional IVR isn’t enough. In truth, these numbers aren’t all that surprising. Customer experience has been a significant business software trend for the past couple of years now. Companies lost touch with their customers by relying too much on technology; however, companies are presented with a Catch-22: they cannot stay relevant unless they use the technology that alienates their customers. Collect customer data to ensure customers aren’t sent to the wrong place by accident. Automate customer support to give customers a successful self-service option. Prioritize valuable calls with call routing, so important calls get sent to the right agents. Better grasp on high call volumes by directing people to right departments, agents, and offering self-service simultaneously. Make your company appear to be bigger than it is, and more professional. But the state of IVR systems in 2018 is changing. Businesses are requiring more out of the technology that makes everyone’s lives easier; customers want the technology they — to be frank — have to put up with to actually benefit them, to give them the positive, self-service experience they’re looking for. 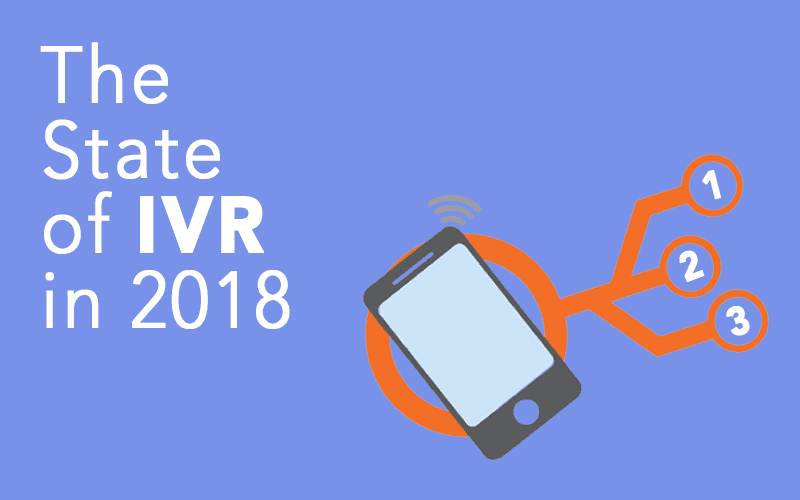 Luckily, 2018 is proving to be a great year for IVR systems. Let’s look at why that is. So now that we know what IVR systems are, what they’re capable of, and what their limitations are, we can now focus on how they’re changing in 2018 and going forward. IVR solutions and VoIP providers are using business trends such as self-service, omnichannel experiences, AI and natural language processing, and mobility to improve IVR in significant — and even visualized — ways. Predicting intent and proactively reaching out to customers to avoid unnecessary interactions. Channeling customers to the right agent or department based on their needs. Detect fraud, capture data, organize and analyze data, and predict outcomes. Propose agent responses, personalize interactions, and cross-sell. Optimize based on interaction and data gathered. Traditional IVR systems were built to offer customers self-service support options while limiting the number of unnecessary interactions between customers and support agents, resulting in what’s called a terminal service. A terminal service is when a caller has interacted with an IVR system and completed a transaction without an agent. Modern IVRs also let customers use smartphones and other channels (We’ll get into that more) to interact in ways that are best for the customer. 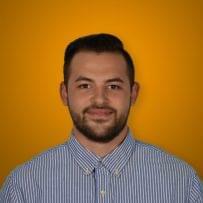 Before we do that, let’s look at some self-service statistics driving IVR forward from Robin Gomez, Director, Data & Analytics at Radial. 73% want the ability to solve product/service issues on their own. 83% use self-service options when available. 59% will not return after a bad experience. What this implies is that a) the vast majority of customers want self-service options b) the vast majority of customers already use self-service options, and c) will not return to a company if they have a bad experience. This means if a company is confident enough in their ability to offer a personalized customer experience to every single one of their customers, they don’t have anything to worry about; if a company makes enough money to either not worry about more than half of their dissatisfied customers because the remaining 41% who do return are willing to look past customer service, there’s nothing to worry about. However, in the real world, businesses want to offer a positive customer experience to every single one of their customers. They’re going to go out of their way to improve their support system by personalizing the IVR system already in place so customers keep coming back. Omnichannel support is an important business trend catered to personalizing customer experiences by giving customers not just multichannel solutions, but utilizing the technologies customers are already using and having them work simultaneously. IVR is taking advantage of omnichannel support by allowing customers to interact with companies on smartphones, taking on a more visual approach to IVR. With IVR, customers can work on a regular phone, VoIP phone, smartphone, and on a computer. Offering an omnichannel experience is absolutely essential in today’s technological world because customers often view traditional IVR systems as tools for businesses that aren’t actually interested in resolving tickets and inquiries. Allowing customers to interact with companies in the way they find most comfortable lets the customer know the company does, in fact, care and us up to date on the latest technology trends — right from the very beginning. Companies are meeting the customer on their playing field rather than forcing them to work with robotic menus. Visual IVR is an important trend that warrants its own section. Visual IVR systems take the trends we just mentioned and combines them all to provide customers with personalized, powerful support experiences that traditional IVR systems are unable to offer. Radial’s Visual IVR solution achieved a 70% containment rate (the percentage of calls that are resolved in the IVR and not transferred to an agent) compared to the typical rate of 20-30% for Traditional IVR. When given the choice, approximately 20% of all callers checking on order status chose Visual IVR over Traditional IVR—an impressive adoption rate when you consider how new the Visual IVR technology is to the retail space. Despite Visual IVR being such a new technology, people are adopting it at rates higher than one would expect. This means that there’s something familiar to people outside the tech industry that can be useful for all kinds of businesses. So what are those features that make it so accessible? And what are the benefits over traditional IVR systems? Callers can take advantage of self-service functions by using a visual menu on their smartphone. Multiple channels for customers to use like smartphones, tablets, web, 1-800 numbers, apps, and texts — no live-agent interactions necessary. Cloud-based, which helps make VoIP integrations more powerful and seamless, and the IVR scalable, easier to manage, and easier to integrate. More in-depth, context- and skills-based call routing thanks to AI and natural language processing. Real-time collaboration: exchanging documents, rich data to reduce average handling time. These features combined make Visual IVR a strong choice for businesses interested in providing more self-service options with omnichannel capabilities. Visual IVR, along with VoIP and other business software providers, is all going to the Cloud in order to provide their customers with faster, more secure, easily scalable software that ultimately puts the customer first without breaking the bank. Consistent service across multiple channels and touchpoints. 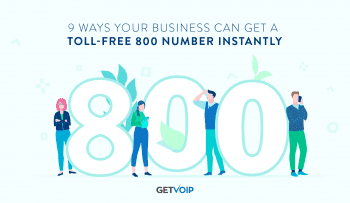 These ten benefits should be more than enough for your business to consider making the switch over to a visual IVR system. This, of course, depends on your business’ specific needs, and maybe a traditional IVR system is all you need. But honestly, because of the fact that visual IVR systems easily integrate with existing IVR solutions already in place, there’s no reason not to try — especially if your customers want better self-service options. Aeropostale recently switched from a traditional IVR system to a visual IVR system in an effort to give its customers better self-service support options. According to Radial, Aeropostale was only resolving 20-30 percent of its calls with traditional IVR. Too many people were also being routed to live agents, which indicated that the traditional IVR system was too limited. Radial then concluded 60 percent of Aeropostale’s customers reached out via a mobile device. Radial, in turn, offered them their visual IVR solution, which led Aeropostale to a 70 percent containment rate (the percentage of calls that are resolved in the IVR and not transferred to an agent). Going from 20-30 percent to 70 percent is a significant jump that simply cannot be ignored. Radial and other IVR leaders are obviously encouraged by these numbers because the only thing holding people back from switching to visual IVR is the fact that it’s still such a new solution. Now it’s time to see who the leader in the IVR world is in 2018. Destination CRM bases their results on depth of functionality, customer satisfaction, cost, and company direction. Genesys posted high numbers in all of Destination CRM’s categories. Their goal is to deliver great customer experiences by simplifying and streamlining business processes. When it comes to IVR, Genesis offers an affordable solution that reduces operating costs, increases productivity, and generates more revenue. Avaya for some time now has been making significant moves to get back to their former glory. They can finally say that they’ve succeeded in overcoming bankruptcy and are capable of focusing exclusively on getting back to the top, with a new strategic shift to a cloud-first model. 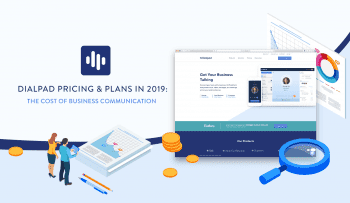 They’ve even acquired Spoken Communications — a top company in Contact Center as a Service (CCaaS) solutions with a focus on customer experience built around conversational AI –, so it goes without saying that the future is very bright. For anyone interested in a powerful Cloud-based IVR solution, Avaya should be considered. Visualize and analyze customer journeys within the IVR. Analyze specific scenarios (e.g. authentication, payments) to focus on key outcomes. Leverage advanced analytics to identify complex menus and flows, automatically recommend optimizations and predict outcomes. Compare IVR routing logic with Nexidia call categories to isolate misrouting problems. Build executive dashboards and reports to monitor IVR KPIs such as containment, authentication, and self-serve rates. Optimizing an IVR is about creating a simple experience, enabling callers to resolve problems on their own by finding all the information they need from the personalized IVR menus. This data is easy to gather and analyze with modern business software such as VoIP and CRM. IVR is typically seen as a VoIP feature, and VoIP integrations with CRM are also common in 2018, so the whole process can be streamlined to create an incredibly powerful user experience. As we’ve already mentioned, IVR is a growing solution for businesses interested in offering better self-service options to their customers. No longer are the days where we call companies and are forced to navigate through boring, robotic call menus that bring us to the wrong department or to an agent that can’t help us. With the rise in visual IVR, companies are looking to give their customers more options that better fit their personal needs, empowering them and encouraging them to reach out more instead of simply giving up and giving in to their frustrations. 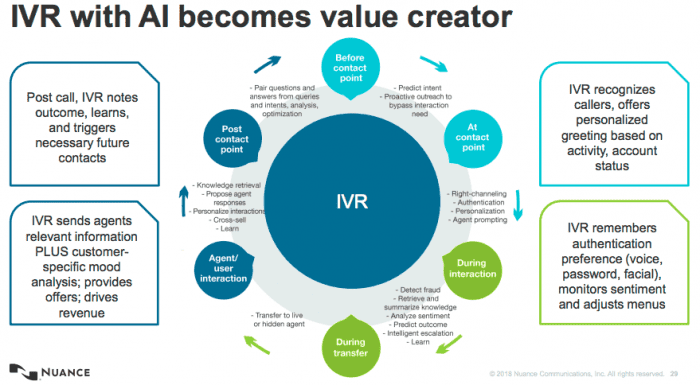 Visual IVR implements AI to provide agents with more context going into every interaction. They also collect more data to even take a more proactive approach to a customer’s needs so they don’t have to call. It can also be accessed online so phones are no longer necessary. Visual IVR is a relatively new trend that’s showing significant potential. The only thing that seems to be limiting its success is the fact that not enough people know about it yet. The numbers show that when given the option to choose between a traditional IVR and a visual IVR, customers go for the visual IVR system. This continues to show that the customer experience is continuing to be a significant business trend in 2018.